CARY (WTVD) -- On Tuesday, the V Foundation for Cancer Research announced the routes for the inaugural Victory Ride to Cure Cancer. In 2018, the V Foundation is celebrating its 25th anniversary, and officials said they're thrilled to be back in the Triangle for the ride on May 19. Each route begins at the heart of NC State University's Centennial Campus, heading west through the campus toward Umstead State Park. 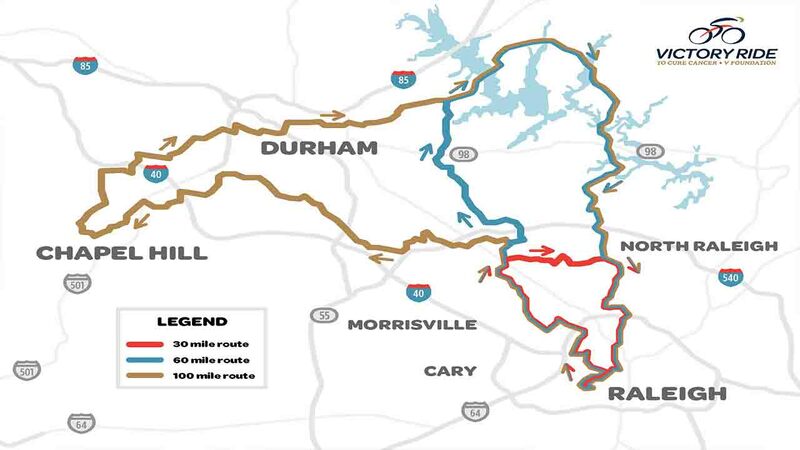 Foundation officials said depending on milages, routes continue through Research Triangle Park, Chapel Hill, Durham, Falls Lake State Recreation Area, and neighborhoods along the northern and eastern edges of Raleigh. It all ends with a post-ride celebration including food, drinks, and music. "We're thrilled to unveil the Victory Ride routes," said Evan Morris, Director of Community Events for the V Foundation. "Our riders will explore the best of central North Carolina while experiencing varied terrains and scenery. This is an exciting way to raise money for the country's finest research." ABC11 is a proud partner of the event. "Our ABC11 Together initiative is all about good deeds, community needs, and how we all can help," said ABC11 President Caroline Welch. "This ride combines all three of those elements - allowing our community to come together to help fight a disease that has affected so many lives and families." There is also a virtual ride option available. More information about the routes and about rider registration can be found on the foundation's website. The Victory Ride benefits Duke Cancer Institute, UNC Lineberger Comprehensive Cancer Center, and the Wake Forest Baptist Health Comprehensive Cancer Center, as well as breakthrough cancer research nationwide. The ride joins the V Foundation's signature events, which raise millions of dollars every year and are vital to cancer research funding. So far, the V Foundation has awarded more than $200 million in cancer research grants.